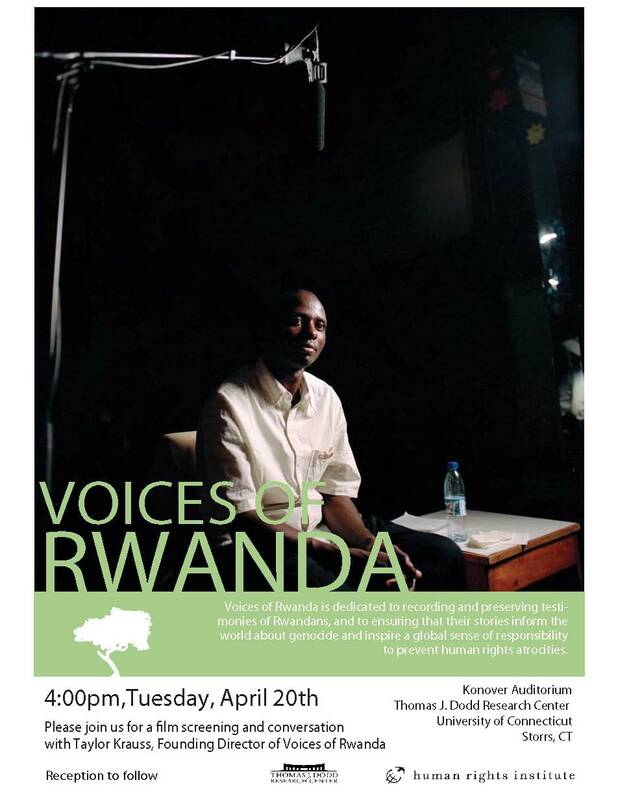 Please join us on Tuesday, April 20, 2010 at 4 PM in Konover Auditorium for a special presentation by Taylor Krauss, Founder of Voices of Rwanda. Sixteen years ago, in April 1994, genocide broke out in Rwanda. Over the course of 100 days, an estimated 800,000 people were brutally killed by their neighbors. Today, survivors, bystanders, rescuers, and perpetrators are all searching for ways to live with one another and with their difficult past. Taylor Krauss, founding director of Voices of Rwanda, will be presenting clips from his filmed testimony from survivors of the Rwandan genocide. Krauss founded Voices of Rwanda in 2006 to record and preserve testimonies of Rwandans to ensure that their stories inform the world about genocide and help prevent future human rights atrocities. Voices of Rwanda currently has a large film archive of testimony and is working with organizations and schools in Rwanda and the United States to make the testimonies available for education and research, as well as community healing. Listen to a podcast with Taylor Krauss from the United States Holocaust Memorial Museum Voices on Genocide Prevention Podcast from December 17, 2009. This entry was posted in Events and News, Rwanda by Jean Nelson. Bookmark the permalink.